Andy: In my previous interview with Michael, he characterized our school as committing a question-based education that defies disciplinary boundaries, would you agree with such characterization? Geoff: Yes, I would. Since I’ve been at this college for almost 10 years now, it’s not hard for me to see a certain core aspect of the college that most of us faculty and most of the students are committed to, which is about raising questions that go beyond the boundaries, not only of disciplines but also of classroom experience. It means that it’s not just about being able to understand a painting, or to have a good experience in the class per se, but it’s about questions that are truly important to one as a human being and the topics which one associates with in one’s life. I can give you a concrete example by talking about the Representation course, which has its own interesting history. I didn’t just design that course out of a blue, instead, the first version of the course was a result of the collaborations I had with Peter (Hajnal). We designed the syllabus together by each bringing in expertise from our own field (art history and philosophy). Even though, I made a lot of changes in the later versions of the course after learning from the students, it still has the spirit of what I discussed with Peter in the early stages, which is the idea of topics (problems, values). In the syllabus, the emphasis is neither on art historical categories like “impressionism”, “modernism” and “cubism”, nor on geographical categories like “Chinese scrolls”, “Renaissance paintings” and “African sculptures”, but, we emphasize on topics like Space & Time, Mood, Originality, Nature, etc. For instance, when you talk about nature, you take a look at a Bruegel painting and then ask questions like, how is nature represented in art? What is the idea of mimesis? How does the changing conditions of the physical environment (the agricultural activities, city life and the weather, etc) affect our understanding of the world? 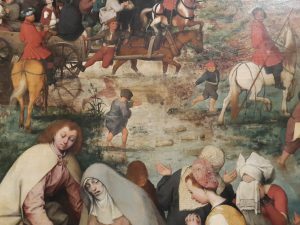 The questions that Bruegel’s paintings raise are not just about art, they are about human experience more broadly, so all those topics are conceived not as art historical topics but as larger questions that are not specific to any disciplines. 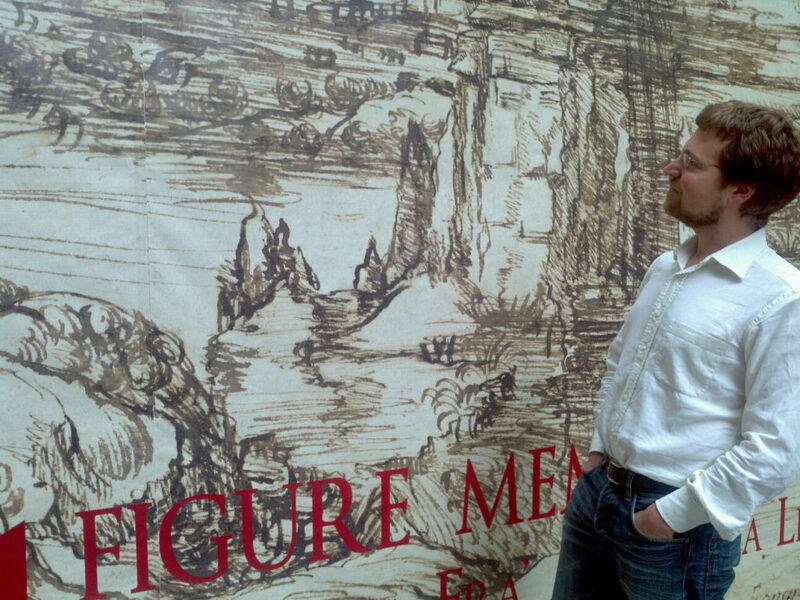 Andy: Talking about Bruegel, I still remember your presentation in the liberal arts education panel on Via Crucis. And I particularly like those cute, innocent children who are completely unaware of the situation they are in, namely the crucifixion of Christ. In a weird way, I find it similar to the children who play hide-and-seek, unabashedly, at the Holocaust Memorial. Geoff: That’s a very interesting comparison. That wold be an element in the painting that is irreducible to any one interpretation. And I would also say, thinking about David’s talk which created a lot of controversy, these things are closely related to his idea of charity. What it means is not to be right away skeptical to the extent that you become closed to the work, but try to see what it has to offer before you decide, which requires a certain amount of patience. But the part that provokes a lot of controversy is about belief, because belief resonates with ideology. But I think there is a difference between belief and thinking towards belief. You can sense the difference between someone offering a theory of everything and ask you to subscribe to it, and someone who also doesn’t know, looking at a (potentially) meaningful object, and say, “let’s look at it together and try to see what it is, so that we may know why it should matter to us.” I think any ideological approach to art is problematic because art is fundamentally non-ideological. During the process of seeing, I would suggest, a certain amount of trust is also needed, which does not mean trust in the authority, but a trust in your own intuition, in something intangible that you feel about the experience — there’s some sort of ‘authenticity’ in it, which is the part that is not ideological. What’s even more important, perhaps, is active receptivity. You try to actively engage with it and articulate the effects it has on you, but at the same time you take care not to impose on the work what you would like to receive from it. So, as long as you keep this active receptivity, even when you start to have a strong opinion about the work (of art), it will continue to give you more. This is why I say a work of art is truly inexhaustible. However many layers of meaning you have discovered in the work, there’re always other possibilities. Andy: On the idea of active receptivity, I thought of a museum visit to the Gemäldegalerie during the Renaissance Florence course. There was this portrait which really made a huge impact on me, largely because I made a serious attempt to articulate the effect it had on me. Interestingly, through my active engagement with the painting, my articulation shed new light on the painting, in the sense that it gave life to the young, innocent boy inside the painting who is hiding behind the parapet. At that moment, I suddenly felt a bit sorry for him — I probably shouldn’t have stared at him like that. Based on what I could read in his facial expression, he seemed a bit uncomfortable about being looked at. After that, of course, I began to laugh at myself, “Why should I feel sorry? I mean, he’s just a painting…” But somehow I still can’t deny the connection that I had with him. Geoff: Well, I should tell you that the inscription on that parapet, “VV”, by Giogione or Titian, is probably short for a Latin phrase which means something like, “made alive for the living.” So the inscription articulates what you described very well — the painting becomes alive because of our lively encounter with it. This is exactly the work which I think should be done in seminars. In your case, if you don’t try to articulate the effect of the parapet, you might just look at it and have a vague sense of some human presence, but by talking it through, you get closer to it. I think of it as a back and forth between something intuitive and something analytical. The intuitive part is the vague feeling that you receive from the object, and the analytical part is the articulation of it, along with listening to what other people in the group are saying, and then the analytical part might inspire further intuitions, meaning that you might have a stronger emotional response to it after you have articulated in a rational way. It’s not like one precedes the other, but that they feed on each other. Another example that I can give you is the Republic. I have discovered, from a long experience of teaching, that the best way to understand the Republic is to articulate your own response to it. Because your response is probably not coming out of nowhere, but mostly coming out of somewhere in the text, and by articulating that, you can see how appropriate it is to the text and what aspect of the text are you responding to. Then you can go back to the text and maybe discover new things in it. Andy: Speaking of the Republic, I still remember Socrates’ critique of mimetic art in Book X of the Republic, namely on the comment that the image/painting of the couch is a copy of the couch, then the couch is the copy of the idea of the couch. Hence, the image/painting is a distortion of reality and should be excluded from the city-in-speech. How would you respond to this? Geoff: I actually think that Socrates’ comment is not so much about painting itself, but more about the characteristics of painting, namely, a paradigm that represents reality. If you read the Republic straight, you might say that paintings are two steps away from reality, hence they are degraded and should be excluded (from the city-in-speech), which is true in a way. But if you think about it more deeply, you realize that the city-in-speech itself is also a paradigm which represents the real city (which is closer to true beings). Should we then dismiss the city-in-speech as a whole because it is only a copy of reality? More importantly, perhaps, how can we relate the words in the Republic to the people who are represented in it and the issues they are discussing, given the realization that those words are only an imitation of a real conversation which we never witnessed? Therefore, the way I read Book X in a nutshell is that it poses the question of how we read images (or mimesis), of how we read the text in the Republic, which are words that relate to something more than just words. And I think the crucial moment in Book X is when they posit the view that images can be very dangerous, unless you know how to read them. 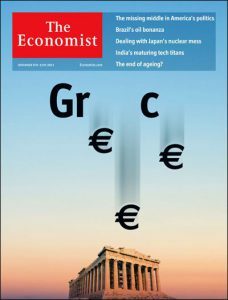 Andy: In your lecture on the Parthenon, I remember that you referenced a cover photo from the Economist. (see below) Is that an example of what you mean by reading an image dangerously? Geoff: Indeed. In my lecture on the Parthenon, what I was trying to articulate is a way to deeply engage with the image, to the extent that you have a dialogue with it. And if you read it closely enough, you see the problems of the Parthenon’s design and construction that its creators at the time were confronted with. Then you can even see how the work was not done by “disciplines” in isolation but, instead, through a dialogue among musicians and music theorists, mathematicians, architects, stone carvers, sculptors, and others. And finally, you would realize that the inexhaustibility of image, the reason why there’s so much stuff packed in there, is part of the character of the image. However, the matter of fact is, if there’s no one there to ‘unpack’ it, it doesn’t matter anymore, which is what the cover photo is all about. When you look at the image of the Parthenon in that photo, the way you view it is like, “oh, I know what it is, it’s the Parthenon. That’s it, there’s no room (and no need) for further interpretation.” The Parthenon becomes this one intelligible thing which you understand like an icon. This is a danger in our image-saturated culture of the 21st century, we are bombarded with images whose intention is for us to quickly consume their meaning without thinking about it. This image means this, then you move on to the next, the next image means that, then you move on to the next, like advertising images, for instance. By doing so, you become an image consumer without the possibility of going deeper. Geoff: Exactly! And that’s why he is doing this, because he is concerned with this problem too. 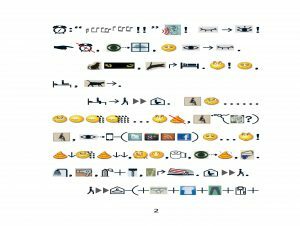 By putting it into a narrative, he reveals how we engage with images in this age — since each icon means one fixed thing, you are not really looking at images, but instead you just instantly translate the images into a fixed package of meaning. It’s a very relevant commentary on the culture that we are living in. Andy: Now, in my final question, I want to talk about a major theme in our interview — disciplinary boundaries. And my question is, what are the differences between inter-disciplinary and trans-disciplinary? Geoff: That’s a very important question, because it is closely related to what this school is trying to do. Let me put it like this: When I was at Yale, I was in an inter-disciplinary major because there was a history class taught by a historian, a literature class taught by a literary scholar and an art history class taught by an art historian. They were each focused on the medieval period, and the ones who study the inter-disciplinary major study all of them at the same time. So it’s inter-disciplinary in the sense that you are doing more than one discipline, but they are still done each in the disciplinary way, which is not to criticize it because I love that program. However, as for this college, the Core courses have a trans-disciplinary character. Instead of bringing 3 to 4 disciplines together and each doing one’s own thing, they address questions that cross disciplinary boundaries, which is the “trans” in trans-disciplinary. 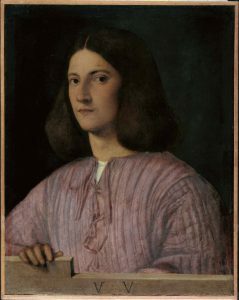 In the Republic class we ask questions like, “Is it to our advantage to be just?”, “What is the purpose of education?”; in the Forms of Love class we ask questions like, “What is the relationship between love and music?” and in the Renaissance class we ask questions like, “What does it mean to be self-reflective?”. By asking (and addressing) these big questions, we try to discover our own values, or simply what we care about. Trans-disciplinary might be a term that people at this college invented, because nobody is satisfied with inter-disciplinary — it’s an approach too well-established in the academia, just like the program that I had at Yale. Geoff: …make us understand ourselves better, certainly! But besides that, which is the point that I was trying to stress — we also care about it more. The caring, the passion and the personal investment in what you are doing on the one hand, and the analysis and self-awareness on the other — those feed on each other. So this interview is very helpful, because by being asked to talk about what we are doing here, and by hearing your responses, I arrive at understanding it better and also at putting more personal investment in it. This is what is great about this place! People who have been here for a while tend to care about the place because it is rather unusual. It asks us to articulate for ourselves what we are doing and to discuss it with our students, and by doing so we become more engaged with it, not only on an intellectual level, but also on a personal one.